The accelerated life test based on the spectrum of fatigue loads was used both in numerical simulation and bench tests of the push rod. The symmetrical cycling of the push rod was presented as the positive pulsating load spectrum corresponding to the stress spectrum of the critical node in the finite element model. As FEM analysis demonstrates, the fatigue crack initiation would occur at the edge of the first-position pin hole with maximum stress and minimum fatigue life. Bench test results show that the fatigue crack initiation and fatigue life of the push rod are in good agreement with FEM data. Translated from Problemy Prochnosti, No. 1, pp. 39 – 47, January – February, 2019. 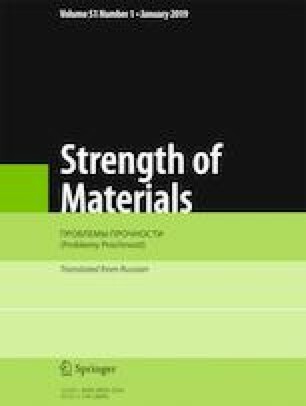 This work was partly supported partly by the Scientific Research Project of Sichuan Province Department of Education (15ZB0137), the Ministry of Education Chunhui Project (Z2015099), Xihua University Natural Science Fund (Z1420105), as well as Open Funds of Key Laboratory of High Performance Materials and Forming Technology of Provincial University (SZJJ2014-057).